A shiny cobalt blue gleamed in the beam of a flashlight sweeping through the evening darkness of the tangled rainforest in Guyana. Holding the flashlight, University of Mississippi doctoral student Andrew Snyder walked closer to this brilliant blue source, lured by the curiosity twinkling from a small hole in a rotting tree stump. 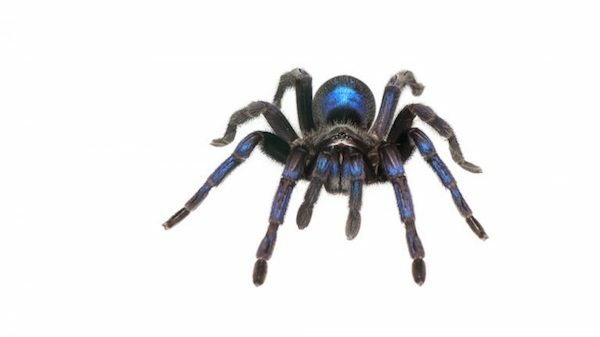 What the biology major discovered is perhaps a new species of tarantula, one whose hairy legs and body are speckled with streaks of metallic-looking blue. “Many jungle organisms give off eye shine, caused by the reflection of your beam of light off of a membrane in the eye, and typically with a characteristic color depending on the organism,” Snyder said. “The blue that my light beam illuminated in fact was not the eye shine of a spider, but rather the forelimbs of a small tarantula. Snyder, who is finishing his doctorate at UM this spring, had been trudging through the rainforest of the Potaro Plateau that evening in the spring of 2014. 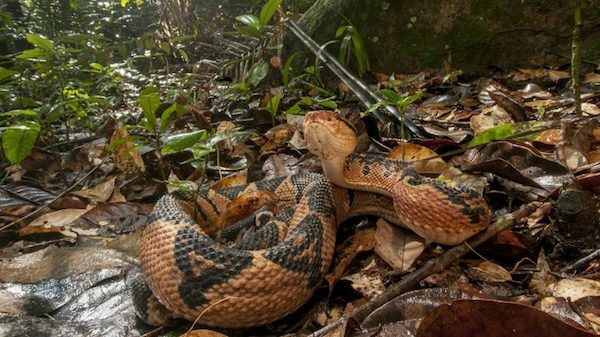 He had been conducting a survey of nocturnal amphibians and reptiles as the herpetologist for a joint conservation research team through Global Wildlife Conservation and World Wildlife Fund-Guianas. Then the tarantula captured his eye. And there were more. The tree stump was pockmarked with holes, and several, if not all, housed a tarantula, each seemingly tolerating a neighboring tarantula. “When I sent the images of the tarantula to an expert who specializes in neotropical tarantulas, he ecstatically proclaimed that this was 99 percent likely to be an undescribed species,” Snyder said. An individual tarantula was collected and sent to experts for verification. The creature is awaiting its formal description, and the process might require a follow-up trip to the region to try to collect a few more samples. The tarantula’s discovery could be publicized only recently. “For a species description, it is crucial to have multiple individuals, ideally both males and females, and across different age classes to account for sexual dimorphism and phenotypic variability (normal variability in external appearance within the same species),” Snyder said. 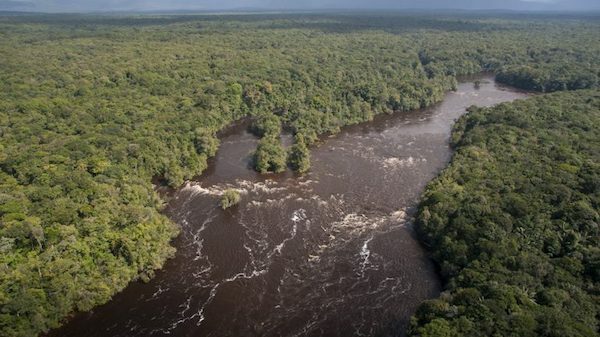 A return trip to Guyana, which hugs the North Atlantic coast of South America and contains some of the continent’s largest unspoiled rainforests, would not be unusual for Snyder. He’s been there 10 times. The Baltimore native first journeyed to Guyana during the summer of 2011, weeks before he started graduate school at Ole Miss. He received his bachelor’s degree in biology with a concentration in ecology and evolution from the University of Maryland. Snyder’s scientific work in Guyana is as a herpetologist, a biologist who studies amphibians and reptiles, and his work is related to his doctoral research through collecting specimens and DNA samples. He’s also visited the country, which is slightly smaller than Idaho, on personal research trips, training programs and conferences. He was last in Guyana in November to participate in a press release for the results of the Potaro expedition. Snyder, who describes himself as a Ph.D. candidate, photographer, conservationist and naturalist, also served as an expedition photographer on the Guyana trips. “While the data collected on these expeditions were valuable to my Ph.D. research, these expeditions were conservation expeditions,” he said. “We were exploring and surveying areas in Guyana that were lacking biodiversity data and facing certain conservation threats: logging, mining, etc. 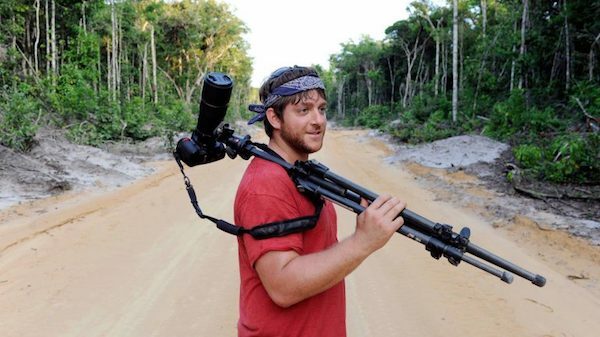 After earning his Ph.D., Snyder hopes to continue his conservation research and photography, perhaps with a group such as the World Wildlife Fund or Global Wildlife Conservation. He wants to continue to contribute to science and conservation, and further public awareness of biodiversity and conservation efforts with his images. Snyder’s passion for herpetology extends back to his childhood in Maryland; his parents allowed him certain exotic pets such as amphibians and reptiles. After receiving his bachelor’s, he spent two-and-a-half summers conducting amphibian and reptile surveys in Cusuco National Park in Honduras with the conservation group Operation Wallacea. “Perhaps most importantly, I began to see the forest for the trees, if you will (while at UM),” he said. “I really began to understand the bigger picture of the work that I was doing or could do. My time at the University of Mississippi also led to so many valuable opportunities and collaborations that otherwise would have never happened. The Noonan Lab at UM is headed by Brice Noonan, associate professor of biology and Snyder’s Ph.D. supervisor. Snyder’s area of research is phylogeography, the study of the geographic distribution of lineages of species or closely related species and the processes responsible for shaping them. Snyder credits Noonan for his interest in phylogeography and his interest in performing research in Guyana. After Snyder’s initial trip to Guyana, he and Noonan brainstormed projects while scanning through Google Earth to find areas for research, which is why Snyder has spent considerable time surveying the Kanuku Mountains in Guyana. The partnership between Noonan and Snyder at UM is not unique. “Andrew Snyder is one of our talented Ph.D. students who work to discover new populations and new species,” said Gregg Roman, UM chair of and professor in biology. “The biology department at the University of Mississippi has many strengths in biodiversity and conservation research. Our graduate students work closely with their major professors and undertake expeditions around the world to learn the science and techniques of surveying and analyzing biodiversity. The Guiana Shield – a geological formation in northeast South America that underlies Guyana, Suriname and French Guiana, most of Venezuela, as well as parts of Colombia and Brazil – is a special place for its phylogeographic value, Snyder said. An upland region leading up to the Guyanese border with Venezuela and Brazil, the Potaro Plateau is between the lowlands of the eastern Guiana Shield and the famed Guiana Highlands. A developing country, Guyana has an abundant biodiversity that is challenged by the country’s richness of natural resources. A delicate balance needs to be struck between conservation and access to and extraction of the country’s natural resources with minimal environmental impact, Snyder said. 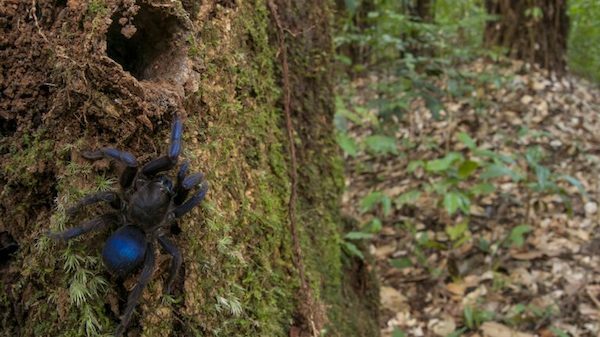 Discoveries such as the blue tarantula reinforce the importance of creating and maintaining that balance, said Leeanne E. Alonso, associate conservation scientist with Global Wildlife Conservation. “Guyana has an amazing range of habitats and high diversity of species, especially for such a small country,” said Alonso, who has worked with Snyder for five years. “Discoveries such as this tarantula help us highlight that there’s so much rich diversity in Guyana, much of it still undiscovered, and all of it contributing to keeping the planet healthy. This tarantula helps to remind us all of the beauty of nature, and that we share this planet with so many interesting creatures. The blue tarantula, with its stunning color, also causes people to take another look at invertebrates and realize the importance of conserving them, Snyder said. “Since this discovery, the amount of people who have commented, ‘I hate spiders, but this one is beautiful!’ is really telling,” he said. “Conservation starts with awareness.